This walk ascends Grand Som from the east, and is really quite special. It ascends the Col du Frêt from above les Reys; descends to the Col du Bovinant; heads south to the summit of Grand Som; drops down to the Col des Aures; and finally wends its way back to the ascent path using some wonderful traditional paths (map). It's special because it covers much of the more beautiful parts of the mountain, and even better, much of it is also off the beaten track. The only section where you're likely to see other people is between the Col du Bovinant and the Col des Aures. At Difficulty 1, it also the easiest of the described routes to the summit. Les Reyes may be found by following the D102B north from the Col du Coucheron for a little under 3 km. Take the road heading up the hill just before les Reyes, take a right junction after about a kilometre and park at the road head (1030 m, grid ref. UTM 31T 72223 50302). As usual, the day starts on a forestry track. This leads past a couple of junctions to the right until it reaches a notice board after some 15 minutes. Here the track becomes a path, and rises horribly steeply for five minutes before adopting a somewhat more civilised gradient. A junction to the left is passed after a further five minutes - take note, as this is our return route. After a further 30 minutes, the pleasant path passes the edge of a beautiful pasture, before turning back on itself and starting the ascent of the first of what are reputed to be 120 zig zags up to the Col du Frêt (we lost count after about a dozen! ), which is reached (1740 m) in under two hours from the car. Horse flies permitting, this is a good place for a second breakfast, with wonderful views down to the Col du Bovinant and across to Mont Outheran. 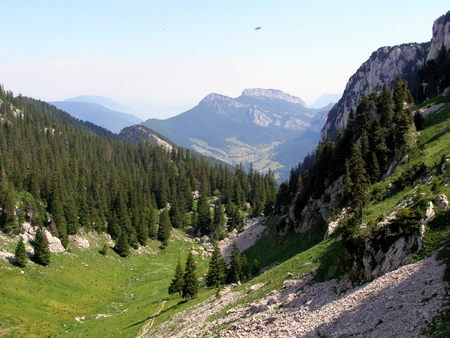 The Col du Bovinant is reached within another quarter of an hour, and the main ascent of Grand Som starts by means of the path heading south-east. One can follow this path all the way to the ridge, and hence to the summit. A more interesting, and considerably less populated route, however, is the Sangle des Moutons. To find this, follow the main path up a little gully to a very positive little ridge. Here there is a junction, with the main path going left, and the sangle path going right. There is a little exposure on this path, but nothing great. One interesting feature is that for some distance it follows the line of the of the hanging-wall of one of the major Chartreuse thrust faults. After 30 minutes, the sangle leads you back onto the main path within sight of the summit cross, which is reached some 3½ hours after leaving the car. We start the descent by following the path that descends the eastern flanks of the hill. This soon leads to a steep gully, just below which is a junction - reached some 20 minutes after leaving the summit (1820 m).To the right leads to La Suiffière. Turn left, and continue down the flanks. A pleasant descent down some cliffs to the col des Aures follows, which is somewhat unnecessarily cable-assisted in places. The col is a superb spot, with some wonderful views towards the Guiers Vif gorge through the hidden valley to the north. The main path drops down to the right, but we take the thinner path onto the Crête des Aures. This is a superb little path through the forest, with fine views of the cliffs to the west. After 20 minutes, you'll meet a positive T-junction. Take the left path, which swings back to circumnavigate the head of a small valley. It's overgrown in places, and care needs to be taken to pick up the line. Consult your map carefully. About an hour after leaving the col des Aures, a forestry track is picked up that heads north across the flank of the valley. Ten minutes later, soon after a track comes in from the left, our path takes off to the left, and follows the floor of the valley. After skirting the right hand side of a clearing, the track becomes somewhat more brutal, steeper, and muddier. This doesn't last long, however, and before long we rejoin our ascent route, and the car is reached in a further ten minutes.